It’s not often that I hire professionals to do a house-related job for me. I love DIYing, and I love learning new things. I like to push myself a little bit further with each project and expand my skill set. But I figured that installing windows was something best left to the pros. After all, you really have to know what you’re doing in order to prevent water leakage (and in turn, prevent the possibility of rotting wood in the future) and to ensure and air tight and energy efficient install. Right? Right. So after doing quite a bit of research on windows (for about six months now), I finally decided to go with a national franchise company that has a location here in Waco. I’ve spoken with them several times on the phone, and was always very impressed with their knowledge and customer service. Their products sounded great, and come with a lifetime warranty. Plus, I constantly see their signs in yards around town. So I set up an appointment. I expected everything to go smoothly, and to have an estimate in hand by the end of that day. Heck, I expected that by now, my new dining room windows would be ordered and paid for, and I’d be expecting their arrival and installation in four weeks or so. Why can’t anything ever be as easy as I expect it to be?! Two guys came out to do the measurements and give me an estimate. One was being trained, but he used to be an installer and is now working in sales, so I was actually glad to have him there since he has actual hands-on experience with installing windows. Well, the first thing they told me was that the configuration on the front window would have to stay the same because the two inside vertical pieces (the pieces separating the side casement windows from the center picture window) are probably structural, and not just decorative. Bummer. I was really hoping to have three double-hung windows of equal width in the front. And call me crazy, but this doesn’t look structural to me. Something structural (i.e., actually holding up the weight of the front wall of the house) would go all the way from floor to ceiling, right? And clearly that doesn’t. But I also know nothing about windows. I could now kick myself for not taking better notice (and not taking pictures) when we had all of the drywall and shiplap removed from the area above this window. That would tell us exactly what’s going on up there, and I’d know without a doubt what’s structural or not. But of course, I didn’t even think about it. But oh well. If they say it’s structural, then it must be. They’re the window experts, right? If there’s no way around it, then I can live with new windows in the current configuration, although I’d probably opt for double hung windows on the sides rather than casement windows, and a solid pane-free picture window in the middle. Probably. Maybe. Okay, I’m not sure. So I was already a little disappointed. Then they moved to the side windows and took some measurements and made notes. They got to the window on the right, and the one guy told the other to make a note that they would need to replace the window sill. That window is in sad shape because it has had a window unit air conditioner in it for years (decades?) and has probably seen more than a few leaks over the years. The window sill is completely rotted. But there’s no way I want JUST one window sill replaced. Somewhere along the line, the window on the left was replaced with an aluminum window, and whoever installed it used regular 1 x whatever wood to trim out the areas around the window, and to build a new window sill. It doesn’t match the other (original) windows at all. Those windows have much thinner wood casing the window and on the window sill. I had just assumed that when you get new windows, all of that is replaced and all of the windows look exactly the same and actually match each other when all is said and done. But when I told them that I wanted all of that replaced on all of the windows, they both looked at me as if I had just requested that they tear down my house and rebuild from scratch. They made a big deal about how that’s not how it’s done, and they didn’t know if they could do that, or if they could find someone who would be willing to do that, etc. Now granted, I’ve never replaced windows. I’ve never installed a window in a new build before. Sure, I’ve watched a few YouTube videos, but I have no hands-on experience of my own. But what I do know is that when you take the window out, you’re left with an opening that’s cased with wood. Right? So why is it a big deal to replace that wood? Ugh! Maybe I have no idea what I’m talking about, but I do know that this is one of the main reasons I hate working with contractors. They very often make things seem impossible when the reality is that they just don’t want to bother. So anyway, when they left that day, they weren’t able to give me an estimate because they said they needed to find someone who could do this obviously amazingly difficult and unusual thing that I was asking them to do. They gave me a ballpark estimate for the windows and a regular install (around $2500 for the dining room windows), but of course, the above-and-beyond work that I had requested would be in addition to that cost. So Monday morning I got an email from them, and was told that they had found someone who could do the work, and they were waiting to hear back from him about how much it would cost, and if he would even be willing to do the work…because he lives in Richardson! As in, he lives in Richardson, Texas! As in, he lives ONE HUNDRED AND TEN MILES NORTH of Waco! North of Dallas! So in the entire greater Waco area with a population of 250,000, and with a contractor on every corner, this company that specializes in selling and installing custom windows can’t find anyone who can take off the old wood from my windows and replace it with new wood, and therefore must bring in someone who lives and works almost two hours away from Waco. This, in a nutshell, is why I DIY. I hate dealing with contractors. I hate them telling me that things are impossible, and making a big deal out of things that shouldn’t be a big deal. I’d rather just do it myself and avoid the frustration of dealing with them. And at least if I do it myself, I know that if it’s done wrong, the only person I have to blame is myself, and I can learn from it and redo it if needed. So maybe it’s time for me to learn how to install windows. EDIT: I won’t actually be installing my own windows, although I think I could if I really wanted to, and with an extra pair of hands to help me. I’ll be calling other companies, and getting more quotes. I’m just feeling a bit frustrated today. I’m sure it’ll all work out in the end. But I can’t, for the life of me, understand how a company that specializes in making and installing custom windows doesn’t have someone (or a few someones) locally who can tackle any and every framing situation they come across. That makes no sense at all to me. Previous Post Kristi, Where Is Your Family Room? And since when have you only gotten one quote on a project. National companies are nice but I have found that you lose that little personal touch with national companies. They have a tendency to departmentalize everything. Everyone is very good at their little corner of the company but know one really knows the ins and outs of the whole process. How about a quote from someone more local? Someone who has been doing it for years and knows all the ins and outs? Please check with a couple of building contractors. I’m pretty sure the replacement should include new sills and trim included in the price. Hiring someone from 110 miles away seems a bit extreme. Do you watch the HGTV show Fixer Upper? Contact Jo and Chip to find someone local who will replace the those windows. Chip an Jo Jo use window world! The stickers are still on in the show, I’m using them to do mine! Window World is the company I called. Chip and Joanna have the benefit of Chip being a builder, and having an entire crew of people who work for them who can frame out windows any way they need to before Window World comes in and installs their windows. Most of us don’t have that advantage. Knowing what I know now, I’d never recommend Window World to the average homeowner. We installed our own new windows a few months back, even changing the opening sizes to do so. It wasn’t actually all that hard. We ordered Andersen windows (by Craftsman) and gave ourselves a 3 day weekend to get it done. That was more than enough time. We did the big one (~50″ tall x 72″ wide) the first day, and the small one (36″ x 36″) and clean up the second day. But you definitely need more than one person to do the install since they can be awkward to work with. Basically, we removed the T-111 siding on the outside of the house (since we used new construction windows not “replacement” windows as we were changing the sizes of the openings, and the drywall was already down in the inside, built a new header (since we were doubling the width of one of the openings), rebuilt the side and bottom supports and used temporary supports to bear the weight while we installed the new header, and then followed the manufacturer’s instructions on installing the new windows (for water protection, wind resistance, and insulation). The old siding went back on, though we needed to cut the openings bigger as we did so. When the inspectors came out to check our work after (new windows need to be permitted and inspected here), they said we did a great job. Considering the windows that were there for the previous 30 years were attached with all of 3 nails underneath the siding (that was fun to find out when we were removing them!) and had no insulation whatsoever, the new ones (with moisture barriers, spray foam insulation, and attached with dozens of screws!) are an absolutely huge improvement! Oh, Man! Don’t get caught on that fishing hook! Can you imagine if there’s a problem and you have to drag him back from 110 miles away? I feel the same way you do about getting quotes…maybe set aside one day of misery and schedule a few contractors to visit an hour and a half apart. I’m sure you’re ready to get going, but let patience rule the day. You work SO hard to get things just right. I’d have to believe you don’t have to settle for what’s easy for a contractor. Find a can do company, not a can’t do, and stick to your plan, girl! Works for me, though (guess there’s a lot more competition for business where I live). This made me laugh in sympathy….It is exactly for that reason that I figured out how to install plumbing, electrical, and am generally going to research how to do something before even thinking about picking up a phone. A contractor who can go with you a little outside of the box is a treasure indeed! My mom found one, so they do exist, but are incredibly rare in my experience. I’ve heard, “You can’t do that” or words to that effect too many times. Now, it was a bit more understandable when I built a bathtub out of wood, but still…. I’m not an expert, but, if you do need the structure within the opening of the window, as long as you still have something there (more evenly placed), why should that be a problem? It would be the same as you did with opening up the door to the kitchen. Just put the new structure in place before removing the old. If you didn’t want to do the actual installation of the windows yourself, could you at least do the reframing of the opening? Although, I think that you could do the window install, it’s just if you want to. The tricky part would be if you had to custom order the windows, and you would need to have the openings framed in before that, but, you could staple plastic up on either side temporarily. I didn’t do pre-hung windows when I replaced some of mine, just fit double-paned windows into an existing framework, but I got mine through a local independent lumber yard. They were super helpful in answering all of my questions, and the windows arrived quickly. So that might be a good place to check…they also might know of someone local who would do what you are wanting. Your getting screwed go some where else. Follow your get. Run. Get more estimates. A good practice any way to get at least 3 on something major. Hold on sister! 🙂 We are considered SUB-contractors (overhead door business) and I can tell you without a single doubt there is another company in Waco that installs windows and sills. We are up in the panhandle – trust me, there IS another small, probably family owned window company down there. Something stinks if the ONLY other sub in your area willing to do work for them is 100 miles away. RUN do not walk from this company. Doesn’t matter if you see there signs all over – it might just be a price thing and not a good service thing. Seems to me you were taken for a sucker. Find another contractor. Or, like you suggested, do it yourself. It ought to be good for a couple of blog updates! Was this company Window World? They only come in and remove the windows and replace. It is very fast and they don’t even add insulation if you need it. I have used them twice and they are fine. I had a handyman who worked construction replace the wood around the windows, after they were installed. He told me that the windows needed more insulation around them, so I bought spray foam for him to use. I only had the handyman do a few of the windows so far. Window World is fine, but you get what you pay for. Also I don’t believe that you need to keep the middle window for structure. I had a house with a large picture window like this, and they replaced with 2 windows and then the 2 on the side. Oh my gosh, that’s exactly who it is! I can’t believe they don’t insulate! I’ll definitely be going somewhere else. If I’m going to pay someone to do this form me, I want them to handle EVERYTHING! From the framing to the install to the insulation. I’ll add the decorating trim after the install, but that’s it. Please do not use those Schmoes… Please. I find it hard to believe that they made such a big deal about what you wanted. It sounds like they are doing their best to just hedge/discourage anything outside a simple window installation, because it saves them money and time and very minimal effort on their part. NOT a good sign. I think some companies can do the basic simple stuff well- but some never expand their skills with the irregular stuff- the odd house, older home, requests outside the “usual”. So they don’t even know how or where to branch out when the situation arises and sadly it probably discourages some homeowners from pursuing what they want and settle for what they are told because let’s face it- dealing with contractors and getting bids is a hassle. It’s annoying, and that’s if you get them to show up in the first place and not be 4 hrs late. I got so sick of being treated like a #$%@$# idiot “housewife”- I make my husband deal with this stuff because I lost the ability to respond in an adult manner and didn’t think I could refrain from kicking some sexist jerk in the family jewels. 😉 This ranges from the jerks who delivered our furniture and scratched the heck our door after I asked him politely to remove the feet from the couch.. to the cable guys to the solicitors (bugs/grass/windows,etc) who won’t take what I say for word (as in “when did you say your husband gets home from work?”) . Seriously. But I digress. Oh, Kristi. I’m pretty sure they didn’t know who they were talking to. Looking forward to your tutorial on window installation. And that’s all I’ve got to say about that! There are 2 general ways to replace existing windows. 1- an insert replacement. In this case the existing frame and sill remain, and they install an entire new window (with frame) into the existing opening. This allow you to keep all of your existing interior and exterior trim, not have to touch those finishes/walls and get new windows. You loose a little bit of glass/daylight typically 1 1/2″, as the new frame is inset within the existing. 2- replace the entire window unit. In this case you remove everything from the original window frame, jambs etc not just the sashes. This generally necessitates removing both the interior and exterior trim to a certain extent so that the window can be properly fastened to the wall and flashed around for waterproofing. You can only do option #1 if the frame/sill/jambs are in good shape and not rotten. Any contractor/carpenter with knowledge and skill should easily be able to do either. Most people doing a huge renovation or gut renovation will choose option 2, so that they’re starting fresh and don’t have anything that’s old or decaying left. My other 2 cents on windows- please please please please please do not use vinyl windows. They do not have a long life span, especially in southern climates exposed to extreme heat and sun, the sash will eventually warp and you’ll have lots of problems with both drafts and leaks. The best windows to buy are wood interior clad exterior. Lots of companies make these windows at all price points. if you can’t afford those, look into fiberglass windows. They are cost wise in between the clad windows and the vinyl, but the fiberglass is a much more dimensionaly stable product. Some companies make them with fiberglass exterior and wood interior. The Marvin Integrity brand is a great example of this. Hope that helps! One other comment- I’d suggest finding a local carpenter/contractor who does window installation rather than a window company. Any local lumber yard will easily have quite a few window brands they rep- Pella, Jeldwen, Marvin, Hurd, Weather Shield, Kolbe and Kolbe etc. Either the contractor or the lumber yard rep will come measure and then you can easily get a quote and compare the prices for a number of different window brands. The “andersons” and other small local window companies don’t tend to make the greatest product. (around here a major one targeting homeowners who do replacement is Feldco) Their windows just really don’t compare with the major brands that builders and architects use. That’s bizarre. Granted, I’m not in Texas, but when we had the windows replaced on our fixer-upper, silks and trim were replaced too. I didn’t even ask–it was just part of the deal. I’d find someone local with more on the line than a franchise. We had a window replaced, including increasing the width of the window. We used a contractor who did all the work including measuring and ordering the window, widening the opening, building the ‘structural’ stuff, drywall, siding outside. I’d try to find a local contractor who does smallish jobs and can do everything you need. We replaced all the windows in our first house a couple years back. The contractor had done many similar jobs, had great reviews and sounded very knowledgeable about windows. His before & after pics looked great, but all the pictures of the window jobs were taken from *outside* the homes. The team fine job installing the windows and making them look good from the outside, but the inside looked awful! They had to remove all our interior window trim to get the new windows in. But when they re-installed the trim, they didn’t fill nail holes or repaint. They did use caulk, but they got it everywhere and it wasn’t even a paintable caulk! So even when I tried to fix up the trim after they left, it still looked a mess. Call another company that can handle window install AND your sills. The fact that this company doesn’t even know a sill guy within a 100 mile radius speaks to how little importance they give to the wood trim work around the windows they install. You don’t want to pay them to install windows and still have a DIY cleanup job to do yourself! These guys overpriced the work because they didn’t want the job. I replaced my windows several years ago and they most certainly can replace any and all trim/sills etc. (I changed my kitchen sink window from a casement to a larger fixed style with a better unimpeded view so everything around it changed) I would get estimates from more than one company/manufacturer and more than one contractor. Plus check contractor references. Some are bad/nightmares to deal with and some are great. You should be able to get anything you want–I just depends on willingness and budget. Chip and Joanna are pros at old homes. I vote for asking them for a referral. Do you know when your Grandmother’s home is going to showcased on Fixer Upper? I think it was your Grandmother’s, anyway. I haven’t heard anything else about it. I drove by there a few weeks ago, and they had torn down the garage, but I there didn’t seem to be much activity other than that. Maybe they changed their minds. Wish you lived in NY and I would lend you my father in exchange for decorating advice. ???? But if you decided to tackle this yourself, I really think you can do it. You definitely need another pair of hands but I have watched my father do this, as well as “professional” contractors and it’s very simple if you have basic carpentry skills. Have you seen this video by This Old House. You can totally do this. So…..call Chip and Joanna and ask their opinion. They install new Windows all the time..LOL . It sounds to me, these people just don’t want to do it!! Evidently this IS the company that Chip and Joanna use. :-/ Of course, Chip has the benefit of actually being a builder, and having a whole crew of employees and subs right at his fingertips who can frame out windows exactly as they need them done. I don’t have that benefit. Repair your old windows or hire someone to do them! I had my old windows re-done and they look and work beautifully! I did have to replace 3 of them (replacement windows) because they had rotted underneath the vinyl. These were 25 year old windows…the 100 year old windows did NOT need replacing. The repaired windows look great, are probably just as energy efficient and since they are not covered with vinyl, I’ll be able to see any problems before they are too big. I did 3 windows at my old house and then hired somebody to do the rest. 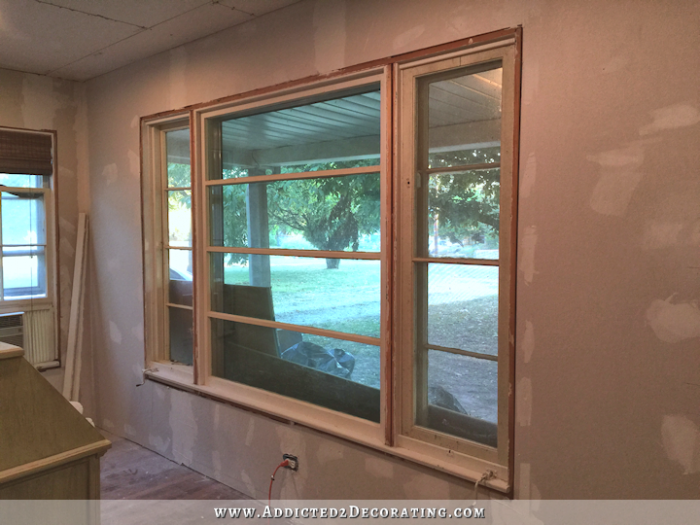 I didn’t want the window size to get smaller as they were only 24″ wide to start with and the frames on new windows took up more space so I tore out all the drywall around the windows and the sills and then the people I hired installed windows that fit that size opening. Then I did all the window trim myself after they were installed. Since you are handy with trimming out doors this really isn’t that much different. You start with the sill and then add the header and two side pieces which would be just like a door frame with the exception of the sill. 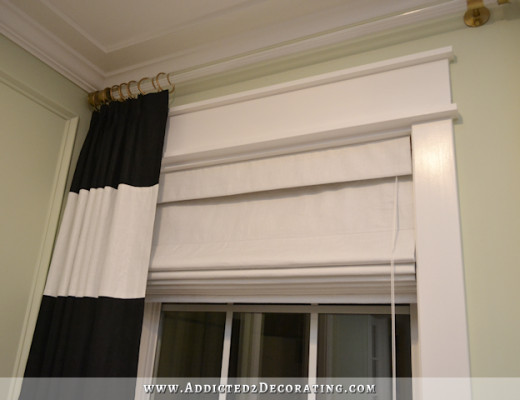 Then add trim around the windows and you are done. This was on the inside. On the outside they just reused what trim I already had removed and then reattached after windows were installed for the hardi sides of the house, and for the areas with stone they set them from the inside and just needed very little mortar patching. If you have framing between the windows making up the picture frame window then it could be structural, but if you don’t I doubt it. You could add back the additional framing support. I used a contractor that did siding and windows and he was from Liberty Hill if I remember right. Maybe they’d be willing to travel to Waco as well. They went to my then house near Dripping Springs. My husband and I youtubed and then installed all 6 of our double hung windows in our sunroom. It was a new build (we built in a section of the covered deck). I think you can do it just fine. Kristi, if my husband and I can do it, so can you. Do some more research and you’ll find out just how easy it is. Purchase the windows and install them yourself. You are so amazing, this is just another challenge for you. And you will save a bucket load of money! Can I encourage you to atleast try one window yourself? I know they look complicated, that THEY made it seem complicated, and undo able? Windows are NOT that Complicated! With your skill set, I know without a doubt, that you can do windows AND they will turn out better than what they would have done! Oh man, I can totally commiserate! My husband and I just bought our first house and we aren’t very handy. It’s been a nightmare dealing with all of the different people coming in and out… and our house was move-in ready — no renovations!! Just small stuff turns out to be the biggest issues. It’s so frustrating!! I would check around. I hate when they act like this also. Many times I think its because I am a woman and they think I will just believe everything they tell me. I hope you have better luck with the next contractor. I’m amazed you will tackle a header but not your windows. You tube it and make sure you want to contract out? There are pluses amd minuses for both methods. I agree with others. My sister almost had to sue over her window replacements. I had mine done from a company I found on Angie’s list. Small company. The installer had been doing it for decades. 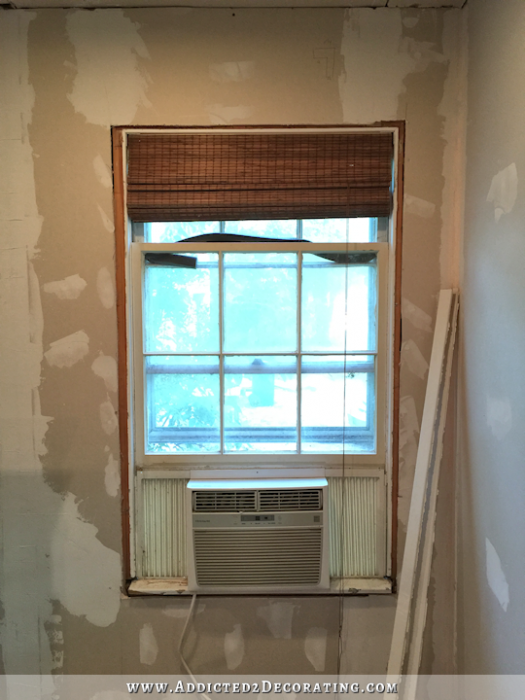 I had 3 double hung windows replaced with a bay window which required additional support. They took care of that and new interior trim also. I had original wood windows in house which were in good shape though. Don’t go with the company that came out. I’ve heard major horror stories about them. 1) You’ve just witnessed the difference between “installers” and “carpenters”. I’ve heard lots of horror stories from people who purchase installation services from the big box stores (Home Depot, etc.) and the guys who come out to actually do the work are local sub-contractors who don’t really know how to do anything other than the very basic install and the finish work ends-up shoddy. Plus, Home Depot is only paying them a flat-rate, so they don’t want to do extra carpentry. Sounds like this company is doing the same thing, more or less. 2) It sounds like they’re selling you replacement or “old work” windows and that’s why they’re trying to get away without touching the trim. It’s also probably why they’re feeding you the line about it being structural (which I’d bet money it’s not…you could pull down that top piece of drywall and see if there’s a header up there). They’re trying to avoid restructuring the holes and trim. 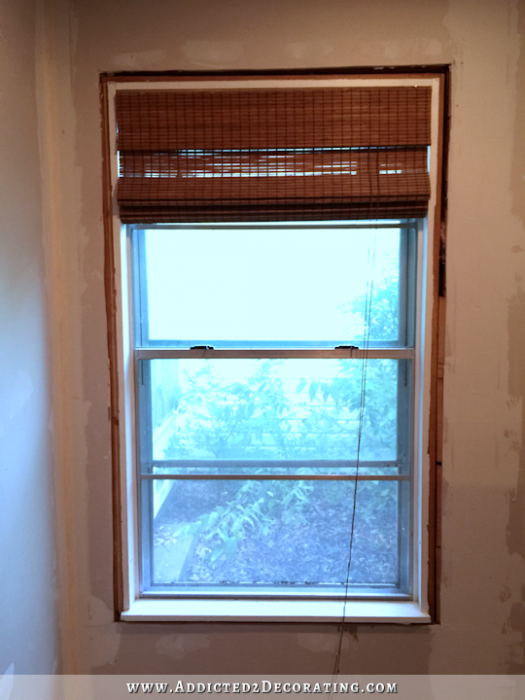 If you had a rough opening…as in a new house or if you ripped the entire old window out down to the studs (removing all inside and outside trim), you’d buy a “new work” window. The whole window would come assembled with the outside trim (called Brick Moulding) and outside sill attached (pitched properly for water runoff). You’d slide the window in from the outside and the outside trim would act as a stop–just like installing a pre-hung door. You then measure it for plum, shim it, etc., and screw it in place. Then, you’d add the inside trim yourself (decorative casing and the “window stool”, which is the little shelf that sticks-out that most of us call the window sill). Depending on the design, some people don’t even want a stool and they just trim it out with casing and you’re done. What they’re selling you is replacement windows. It’s basically the same thing without the exterior moulding and they cheat the installation by taking out the old window sashes (the actual window panels), and all the moulding, stops, and tracks that hold them in. What you’re left with is the outer wood frame from the original window and all the decorative trim. They then order the new windows about 3/4″ smaller than the original ones, slide them into the old frame, screw, caulk on the outside, and either caulk or use quarter-round on the inside to cover the gap. This way, they don’t have to touch your decorative casing or the window stool. 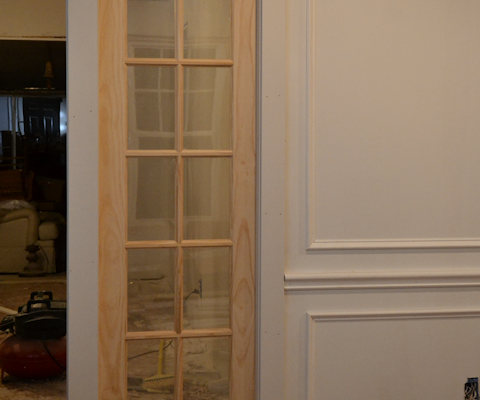 To put it in the perspective of a door frame (which I know you already know how to build), it’d be like removing the door panel, hinges, and stop, and then sliding a new slightly smaller pre-hung door into the side moulding from the old door and hiding the gaps with more trim and caulk. Anyway, if it were me, I think I’d find a local home improvement contractor to do the job right and, if you like this other company’s windows, just order the windows from them. 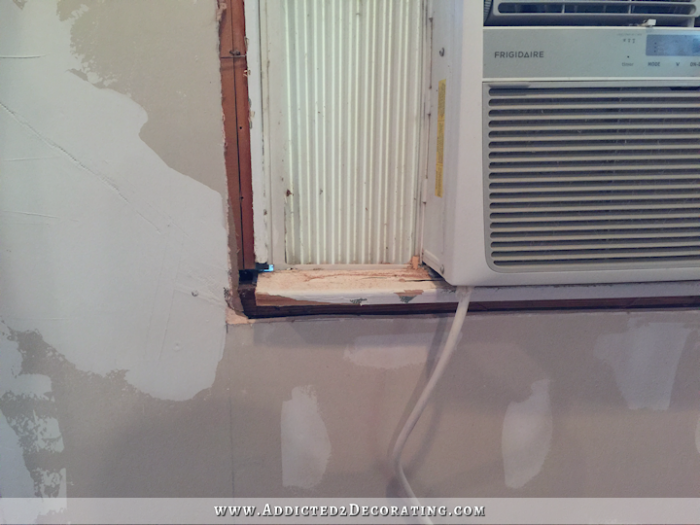 A real contractor may just decide it makes more sense to rip out to the rough opening and do it right…especially if you want new interior trim anyway. And if they put in a new work window, you could even do the stool and trim yourself. This guy knows what he’s talking about! I agree 100%! Thank you, Justin, for some clarity! Kristi, Justin makes sense. Kristi, I am here in Cedar Park, TX and last year I had all of my windows replaced by Champion Windows and they had to completely rebuild a couple of my window structures because of water damage and it was just part of the job. They did a fabulous job and the windows are beautiful inside and out. Best yet was the price! Call them! Oh Christy, none of the window conractors will build your window frames, they just install windows. And you can’t let them hire whoever rebuilds your frames because you will be charged twice for that. Just find yourself a reasonable contractor who builds or renovates houses, have hime take measurements of what size windows will be needed and when they come in, let him build new frames for the windows. You don’t want framing built by a windows contractor. That’s not their job and I assure you they will charge you dearly for anything outside their scope of work. You can still buy your windows from them if you wish, but don’t allow them to touch the frames. Go to Lowes or Home Dept and ask for a referral from the guys they deal with…they know them all and they see the really good technicians all the time, especially the sole-proprieter’s, who are local and who rely solely on good word of mouth advertising. I sure hear you out contractors!! I’m a 68 year old widow and on my own have done some really amazing things around my home. But now and then I need help. I hate it when young guys come out and think they have found a sucker!! I very nicely let them know that they’re not a good fit for doing work on my house and kick them out. You are an inspiration Kristi! I follow several blogs but yours is the one I open first. I’m getting so many great ideas from you. Thank you!! Wow. Just wow. Yes, I know you will be getting other estimates! I’m so bad, I’d probably get all the other companies to come at the same time for the next estimate and let them compete. Like the bachelorette, but with contractors. The winner gets a rose! I’m sure it would backfire on me, so don’t do that, lol. Just thinking out loud here…Is there someone you could hire to help you install the windows? That might be a nice compromise. Then you could DIY it, with another pair of hands to help. You have some able bodied neighbors who are retired/semiretired? It might come out cheaper, with the quality result you want, and I know you will trim out those windows fantastically! You could use the leftover $ for something “fun”. Putting in windows isn’t that hard actually. I have done it and I haven’t done nearly as much DIY as you have. I have found it is cheaper to buy the windows from Lowe’s or something like that and then hire a contractor or construction person to install them. I agree completely! I’ve helped replace a few windows and was very surprised at how simple it is. With an extra pair of hands and patience it really is a DIY job, especially for someone at your skill level. Okay this may be unpopular, but I would remove the drywall and shiplap above the window, and take a look at the structure so there is no second guessing about those dividers. I would then look up contractors on Angie’s List and set up an appointment with three that had A ratings. Many times, contractors have discounts for Angie’s List members, if you go that route. I would leave the structure open for the contractors to look at and ask for bids. You can and should also get references from previous customers. Also, when talking to the contractors, let them know you blog and that if they do a great job, you will put in a good recommendation for them. You are far from a novice and need to let your construction knowledge show. I’m pretty sure this is what they call “dodging a bullet” and you dodged a pretty big one! Kristi, It’s refreshing to know I’m not the only one who feels frustrated with contractors. 5 months ago we noticed a leak near our shower, and through many months of frustration trying to talk to contractors, decided to figure things outmyself. Hardly anyone returned my calls, or didn’t want to do just one asprct of a shower remodel~ the whole thing. It DID feel like they were trying to shame me into spending $$$$ on a shower build…so I began figurig it out myself. My dad helped with some framing, but I have been taping, mudding, tiling and it’s looking great.???? You are SO skilled, this seems like it will be another great project to tackle, and will save big bucks for you. Sometimes I think I should become a contractor, and would be successful because I would actually return calls, and work with people’s creativity! I feel really frustrated for you as well. My husband has been in the glazing business for 40+ years. He’s always done our window replacements. So of course, there is carpentry done at that time. Hiring a contractor to do the install would include him doing new trim before the window install. If it was major work, he’d order the windows and then prep the openings for the install. My mother had all her windows replaced in her 1974 home and the glass company did replace the old wood and trimmed out with new……so it surprises me this company, especially being a residential glass company, isn’t prepared for this situation. I’d shop around. Generally glass installers aren’t carpenters, except in commercial where my husband is a carpenter and a welder. In the Pacific Northwest, the requirements for installing windows has changed. Good changes because it protects any moister from getting in through the sill. Anyway, watching my husband replace our 11ft x 7ft picture windows made me appreciate all the work he does. The new build up and trim took longer than popping the new insulated windows in. He hasn’t worked residential install for years…..now he rappels off the side of high rises, in downtown seattle, and inspects windows from the outside. The problem isn’t that they couldn’t find a contractor in your area willing to do the work, it’s they don’t have any subcontractors in their network (ie that have a contract with their national corp.) in your area. Please, please, please find a local, family owned company. They may be a little higher on price, but you will be supporting the local economy and, most likely, will be more satisfied as most local companies stand behind their work because their reputation is everything for them, wheres a national company couldn’t care less. Best wishes! You are getting great advice. If I were you I would call Home Depot and Lowe’s to get a ball park figure on what needs to be done. You will need a header for your windows and framing below but simple. We had a 4 x 8 wide window wiht fixed panel and sliders in a wall and my hubs removed it. Made the opening five feet tall and we put in three fixed panels windows that were equidistant apart. Looks gorgeous. You jsut need headers and framing to size. Our house was stucco and so we just installed wood inserts on the exterior of the house as were are too cheap to stucco. Neighbors love the look. I agree contractors can be pains. Just an FYI, each window should have a header over it, just like over doors. While I agree that the very end sides nf the casement windows are probably structural, I highly doubt the centers are. I’ve installed my own replacement windows in my last home, 130 year old Mansard Roof house in Boston. I then made my own sills, and trimmed out all the windows. This was before the internet, so no such thing as a Blog existed. You don’t need a contractor, you need a good, carpenter. If my husband wasn’t sick and we didn’t live in NH, He would do those to windows to your spec. You would still order windows, but not installer. He used to work in weatherization as well, and know how to make a window air tight. When the dry wall was off, was there a header over the big window? If not, then I would put one in, I know you just did the drywall, but this is important. If you don’t already have some, get a roll of Bitcihane Spelling? It’s used when roofing to make it watertight. Make sure you or someone puts in around the window area, no water can get past it. Make sure to stuff insulation in any space you can. Do not use expanding foam it will cause problems, they make one that gently expand just for around windows and doors. Caulking is your friend. If you can gut a kitchen/bathroom i am confident you can replace windows. I can replace a faucet and run the vacuum; you can do this, lady! Educate yourself and get advice; I totally understand your frustration. I am at the mercy of idiots and a-holes. These guys work for a big company instead of for themselves because they want everything to be easy and familiar. They want someone else to do all the thinking and for certain they do not want homeowners to have an opinion. When we moved from Raleigh to Pittsburgh I noticed that none of the houses in the Burgh had central vac and I wanted it. Raleigh had experienced high growth and the housing was much newer. But it should have been possible somehow. Even if some drywall had to get broken. The guys from the vacuum company in Pittsburgh acted like I was asking them to build a space shuttle. They would have to cut the drywall – horrors. Then I found a great electrician husband and wife team and he put his mind to it and figured it out, utilizing a laundry chute for some of the duct. Now in yet a third state I have an amazing contractor who produces work of a higher quality than I can even imagine myself. And, yes, he works for himself. When window companies like champion replace window they don’t remove tHe whole window(frame sills) they remove the sash and stops and pop in a new window frame and all. They are window installers not carpenters. Replacing Windows like this is all they know because this is all they do. You need a good carpenter and a window supplier and have them coming e out and help you order the Windows you need for what you want. Sure a window can be reconfigured. If a new window can be placed in a wall where ther wasn’t one certainly one can be reconfigured. You need to keep looking for the right person. When we moved into our house, we replaced a large plate-glass, floor-to-ceiling window in our living room. We contacted a window company that advertises nationally. For one window, they couldn’t be bothered. Then we learned about a local company that sells doors and windows. A friendly and professional salesman came with some great ideas. We ended up with what looks like two adjoining French doors with transoms over the top. The window is beautiful and transformed the character of the house. The company also recommended a carpenter with whom we were very satisfied. At least be grateful that your window guys were so transparently unsuited for the job BEFORE you hired them. Consider this a blessing in disguise. We had all new windows installed in our home five years ago. We had to wait approximately 8 weeks from the time we ordered them until the installation date and “No,” the window installers do not put in new sills, etc. In fact, we called them to come back out to show where water was coming into the house at the base of one of the windows and were told that was due to an interior gap below the window and that was our responsibility. 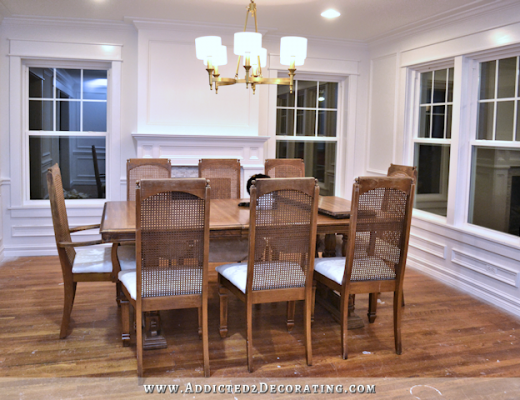 They installed the windows into the existing woodwork and caulked around the parts they replaced and that was it. Ours are also well known window contractors with a lengthy warranty on the windows and their working parts. Hi Kristi, I’ve worked as a property manager for the past 20 years and have hired companies to replace all the windows in small apartment buildings at least 4 times. I think you’d be MUCH better off hiring a carpenter to do your sills, as most of the installers these days don’t have good wood working skills. From my experience, installers only replace the wood stops during an install and only if they break when they remove them or if they aren’t reusable due to existing damage. Wood replacement is usually in addition to the quote and is charged by the linear foot. It’s hard to tell, but from your second picture I don’t think those vertical 2x4s are structural (as in holding up the roof.). If they were, they’d run floor to ceiling like you mentioned and you’d have 3 separate headers above the window or if they were needed to hold up one single header they’d have to run to the floor (like posts in a basement that hold up the steel beam that runs under the load bearing center wall). It looks like the 1x on top of the window (painted white) goes across the entire window and the vertical 2x4s are only the height of the window and not carrying any of the load from the roof. Good luck!!! Hopefully you can get some bids from other companies. You can order windows thru Gross-Yowell. They are over off of Franklin Ave. They will order the sizes you want. They could also give you names for who installs them, I’m sure. They are closed on Sat. and close pretty early on week days, @ 5:30. My husband gets a lot of lumber, etc. from them as they’re usually cheaper then Lowe’s. There’s a man that does put in windows and does carpenter work, his name is Alfredo Mullet 254-366-2256 and he knows what he’s doing. I am hoping you take on this task with a few strong arms to help you, you who are the brains of the outfit! I had the best luck in my area by finding a farmer’s co-op that allowed me to order the windows I wanted. Then I hired a separate contractor to do the install. The contractor gave me a reduced rate if I was willing to wait to have them installed at a time he had a 3-day break between jobs. He only needed 2 days for all my windows since I was doing DIY trim around them all. It worked out great since like you I kept running into people who said “It can’t be done!” or would quote me something double the price for the exact same Anderson windows. I swear I need to get into the window install business and shape it up. Kristi! This is a project you can easily accomplish. My husband I have replaced ALL the windows in each of the two houses we have lived in. We don’t have half the skills (or patience) that you do. Do not be intimidated! This project is easy compared to what you have already done to your home. Oh, I do know well what you are going through. Having had years of owning homes and no longer being able to do some of the DIY that I once could, I have learned a few things about using contractors. First, for jobs costing the money that window replacement does, I get no less than three estimates and that is after all the research. Most likely, you will find that their methods, and knowledge levels may vary to some degree and sometimes a lot, Also, with more than one estimate you will have a good idea of the going rate in your area. Beware of contractors that say “No” a lot o the time or that say Yes to everything. A good contractor should be able to tell you exactly what they will be doing and why. If what you are asking is not possible or not usual the contractor should be able to tell yes we could do it that way but here are some things to consider and then an explanation such as “it is much more expensive, or based upon the construction methods in the era you house was built” or similar. Kristi, there should be no reason you can’t change window styles given that it isn’t unusual in remodels, etc. Also, I agree with other readers that a good way go go for estimates are remodelers, carpenters, and a good handyman with experience. I tend to like these sources because they frequently have experience with multiple brands and can be a great help in sharing the experience of the different brands. Often brand names that we all recognize may not always be the best option and can be more expensive since someone pays for all that advertising and guess who that is? Also, for jobs costing several thousand be certain to get references, usually three to five depending upon project costs, and CHECK THEM. I know that sounds obvious but its amazing how many people don’t actually do that. Lastly, ask the contractor what sort of contract he will furnish if you decide to go with his company. Contractors should sign and have you sign a contract with includes some type of Statement Of Work so that each of you know exactly what is to be done, exact costs, and the start and completion dates. Now obviously that doesn’t mean you expect a 25 page document but these basics need to be written to prevent misunderstandings on either side. Also, there should be a paragraph that addresses Change Control so if you decided you want to add change part of the written terms, there is a way to address those request. This protects you and the contractor. It gets your requests written in the Change document and gives you the information that your request will make, such as additional time or monies. Good places to find information on your subject is the national organizations that most industries have. For instances, if you are looking at hardwood floors or carpeting etc. Look up the national association for the flooring industry. A quick internet search will help you find them Most have “what to look for when buying…” whatever you are looking for. Kristi, a lot of what you related about your experience with this company raises red flags with me almost from the beginning. There is just too much in attitude, lack of knowledge, and a distinct lack of straightforward andsweres that should not occur with a seasoned company, especially if they are only a window company. Good luck and I’m sorry you had this frustration. Oh, and I may wish myself good luck also since I am working on deck refurbishment, flooring, painting, and a few more projects.. Yes, I may well be senile by the time I finish. Maybe somebody from Home Depot or Lowes can recommend a contractor to do the windows. I love what you are doing to your house – that kitchen is just wonderful. This made me giggle. I live in Richardson, with a niece going to Baylor. So I am painfully aware of the drive. I say keep looking. We used Champion, and were very happy. Home Depot and Lowes had competitive quotes too, but we went with them for the warranty. We got new windows vinyl windows several years ago. I was told that they are window installers and NOT carpenters. So my new windows sit on top of the old window sills…as in not down inside that slot. Lucky for me (I guess) there was no rot or any other problems to deal with because they wouldn’t have fixed it. It actually looks OK. My window sills are now half as wide as they were originally.We remodeled the kitchen a few years later and my contractor installed the window he helped me order from Home Depot . It fits perfectly and sits down in the slot so my window sill is the regular width. Ask Home Depot and Lowes for some recommendations and ask your friends for some contractors names. I’m so relieved to hear this happens to people other than me! New AC installed on a wooden platform that was completely rotted from the old AC leaking, and acted like I was crazy for wanting it replaced. Or the flooring guys who acted incredibly put out that I wanted base and shoe. Or the crown installers who treated me like a whiney brat for expecting them to caulk the gaps. Well, my stories could go on. I don’t like paying others to do stuff for me, but when I do hire a pro, I expect it to look like a professional job. I hate when I fork over a large chunk of money, and look at the result knowing I could have done it so much better. You could do the windows easily if you wanted BUT if you don’t want to, get quotes from your local glass companies. My hubby owned a glass company at one time and installed them for about $35 each. That included removing the old one and insulating around the new one. Sometimes he would do minor wood repair for that fee. That was a while back and I am sure pricing has gone up but I bet you will find that your local glass company will do a good job for a much more reasonable price. Good luck to you. We’ve had Windows replaced in 2 houses. Went with a local company who made their own Windows. When we changed a patio door to Windows we bought a new install window from lowes & did it our self as we were building wall as well. Main thing was getting it square so it would operate correctly. I would go with someone just for the warranty but I agree this is not the company to go with. Take a drive around your neighborhood & look for housed with replacement Windows & ask who they used & if they were happy. Do you have Angie’s list? You may want to contact them for an estimate. Good luck. I really want you to have new Windows. I just looked @ Angie’s list in Waco & they have a list of 49 window installers to avoid & 16 top installers. You can check their reviews. You can also check the BBB if they are in good standing. Even companies that aren’t a member have files listed if they have had a complaint. If they are good replacing the sill will be no problem. When you insulated I take it you saw no sign of rot under the sill. You could go ahead & pull the windows out & replace the sills & cover them up with plywood on the outside till your Windows come in. 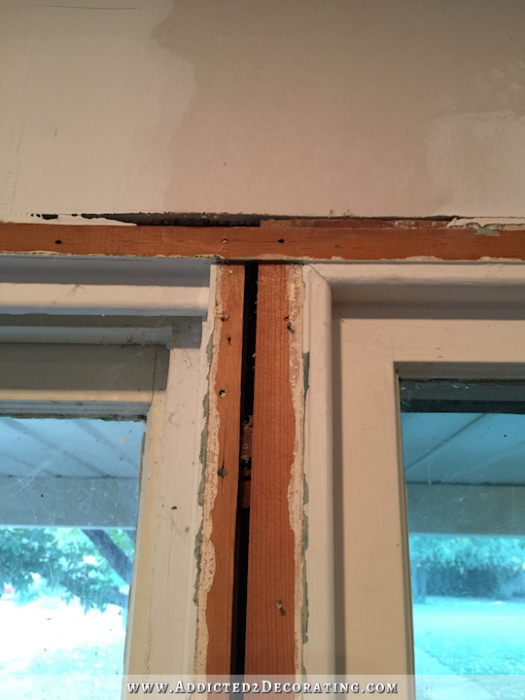 The trim is never touched with replacement unless there rot to be fixed. That shouldn’t even be part of your estimate. This blog post/thread has been HUGELY helpful for me! As first-time homeowners of a house approaching 100 years old, I was figuring we’d have to replace a lot of the windows (the frames and sills were not maintained by the previous owners), and I was NOT looking forward to the process. I now have hope! We have a lead already on a great carpenter/handyman, so I’ll be talking to him FIRST before trying any big box/big brand places! Thanks for the post, Kristi! I can relate to this I could NOT find a contractor for our tile work on our foreclosure house and hired someone from five hours moth to do the job. So sad! It’s done now, thank goodness!! What you ended up with is a company who advertises all over and had a building full of talking heads that give you all the answers that you or anyone else wants to hear. Then they send someone local to you town that they sub out to. The guys you got are not very good. Don’t you have a lumber yard in Waco? They usually sell windows. They will send real wood worker guy out to assess the situation take measurements and let you know what it will costs in a few days. It will probably take a month or two to order your windows and then have them installed. I would not use these first guys ever. Find someone local. go to home depot and ask at the contractors desk if they can recommend someone. You don’t want to screw around with windows, they are for life. Get what you want If you want double hung in the front then tell them that. They can build a frame and do it. Blessings. They obviously didn’t know who they were dealing with!!!!! Use your own common sense and diy it. I can understand your frustration. One thing I would say is if you end up going with a contractor make sure you check the Better Business Bureaus website. They list all the complaints on the business and any customer reviews that the business might have. Also, they assign a letter grade to a business. Very helpful when making a decision. Good luck to you! I haven’t finished reading your post yet. But as soon as I read it probably is structural is just not true. They can do anything with windows. We went with a company that is not well known but make a fabulous window. With a name brand you are paying for their advertising in the price of the window and your two guys are looking to make a few bucks restructuring things for you. They obviously don’t know how handy you are and what you have done with your home yourself! Get at least 2-3 more estimates…any thing is possible. Kristi, consumer report came out with this today. Might have some info you might be able to use. Woman sitting in a sunny window. Lately offers from window manufacturers and installers arrive in the mail promising 20 percent off all windows, 40 percent off qualifying installations, and so on. Replacing windows is expensive and if installed poorly even the best windows won’t provide the comfort or look you paid for. Here’s what you’ll want to know before you take on this project. Saving money on your energy bills is not the reason to replace your windows. It could take decades to recoup the money you’ll spend. Energy Star’s “Get savings in your city” gives you an idea of your average annual savings if you replace single or double pane windows. Upgrades can easily add 50 percent or more to the base cost of a window. So focus on features that add value. Low-E coatings improve efficiency, but triple insulating glass probably isn’t necessary unless you live in an extremely cold climate or very noisy neighborhood. Window scene featuring new windows. Prices can vary among dealers and manufacturers do offer special deals so check their websites and shop around. Some utilities and city and state programs offer rebates or incentives to buy Energy Star windows. And keep in mind that you can save on materials and labor by using partial replacement units—also known as pocket replacements—when the existing frames and sills are sound. Otherwise you’ll need full replacement windows. See our window buying guide to learn more about window types, styles, and features. Then check our full window Ratings and recommendations of 21 double-hung and four casement windows. We found big differences between brands. Proper installation is just as important as choosing the right windows for your home and climate. Many of the big manufacturers train and certify installers for their specific products. Relying on the same contractor for purchase and installation can lessen the chances of problems arising later. Look for certification from the American Window and Door Institute or Installation Masters and get multiple bids. Number of Double-hung windows we’ve tested this year alone. I grew up in western Pennsylvania and knew someday I’d live in New York and write for a living. And here I am writing about matching washers and dryers, the best and worst ranges, and lightbulbs, energy-saving, of course. But what I’m really doing is trying to help consumers. That’s my job.